Batted like a dream, he was the only Indian batsman who defied the English attack and it was a shame that none of his teammates could give him company. With three hundreds, he batted magnificently and also become the third Indian to carry his bat. Apart from that he even kept wickets when Dhoni decided to have a go with the ball. He accomplished what he missed 15 years ago by scoring a hundred at Lord’s and his masterful hundreds at Trent Bridge and The Oval prevented India from even more serious embarrassment. It was also the first time that he became the enforcer in this Indian middle order. India will find it extremely hard to fill the void left by him whenever he calls it a day. Looked totally out of sorts with the bat in the first two Tests. However re-discovered his batting form when he biffed his way to 77 and 74* in the third Test at Edgbaston. His keeping was not up to the mark and at times looked clumsy. His captaincy was also not inspirational and lacked the usual zest; it did not help his cause when he lost some of his key bowlers midway through the series. Turned his arm over and even managed to get KP out only to be overturned by the DRS. With the imminent retirement of the trinity, it will be testing times for Dhoni to lead India with the generation Y. The one thing he did right the entire series was to of course warm the English hearts with his “Spirit of Cricket” display when he recalled Ian Bell to the crease. He was part of the series for just one Test and put on a partnership of 128 runs with Dravid, the only time India looked better than England the entire series. This was during the first innings at Trent Bridge. He scored a sublime 62, however looked terribly susceptible to the short ball during the second dig. Fractured his left index finger on the fourth day at Trent Bridge while facing up to a bouncer from Tim Bresnan and was out of the tour. By any standards, this series was a big letdown for him. A great performer for India , 22 years and counting, he was indifferent this series and got out after getting some decent starts. The only time he looked convincing was during his last innings when he scored 91, which still did not help India avoid the whitewash. His lack of match practice showed up during the first two Tests and in hindsight he must have realized that missing the West Indies tour was not such a great idea. It remains to be seen how long he plans to go on before calling it a day. Another Indian who got starts and threw it away by making poor shot selections. Be it his 56 at Lord’s or his 54 at Trent Bridge, he was undone by ill-advised strokes. He may be a free flowing stroke maker, but some times his shot selection leaves a lot to be desired, although in between he got out to some jaffas. Overall the failure of Laxman and Tendulkar not supporting Dravid severely dented India’s fortunes. With the Indian Test batting at the crossroads, he needs to re-discover some of his magic before India’s next series. Totally ineffective as an opening batsman and was picking up injuries at the drop of a hat. After the Lord’s Test he missed the second Test owing to an elbow injury and came back for the third Test and failed to impress. Picked up a minor concussion and could not open the batting in both the innings of the final Test. For a start he should stop fielding at the short leg position to avoid these freak injuries. Needs to discover his consistency and also needs to manage his body well, if he is planning on being India’s Test opener for the next few years. For someone considered the savior of India after the second Test, he bagged a king pair on his return, got dismissed for eight at The Oval and seemed to rediscover some of his touch during the second innings but got bowled through the gate by Swann for 33 and was out of the tour. He was completely out of touch, totally unfit and lacked any idea and was a pale shadow of a batsman who had destroyed attacks in the past. Needs to get more match fit and stay a little bit composed if he is having any hopes of being the Sehwag of old. At the end of the Test series he was ruled unfit for the ODI series, which brings the question if he was really fit in the first place. Apart from his fighting 78 in the second innings at Lord’s, he was absent throughout the series, scored a grand total of 27 runs in the remaining five innings, appeared generally clueless during the entire series and bagged a pair at The Oval. He does not really inspire any confidence at Test level and it remains to be seen if he can be part of India’s Test future unless he can improve his ability to handle himself well mentally. Provided some respite for the bowlers by bowling his innocuous offies and even managed a few wickets. A batsman with very limited technique, scored a fighting 49 at Lord’s before getting out cheaply for the remaining three innings. He got a hundred at the warm up game only to be dropped for Sehwag to bag a king pair. He is young and can only improve from here on. With Gambhir and Sehwag having a spate of injuries and inconsistent form, Mukund can try to make the opening spot his own, if he can improve his technique. Lasted a grand total of 81 balls and a couple of sessions, before pulling his hamstring and getting injured. He was virtually unplayable during the time he lasted. Another player who needs to focus on being match fit, probably should work on cutting down some of his workload with reducing the amount of ODI’s and T20’s he is playing. Of course he needs to be doing some laps in the gym to reduce his belly too. An utter failure with the ball, he was never a threat to the Englishmen and looked totally lost. His bowling had lacked teeth for some time and this series was probably the last straw. When there were rumors of him being dropped for the third Test, he promptly got injured and was sent back home. For the last two years he has been averaging almost 40 with the ball and it’s time the Indian selectors look beyond him, especially with the likes of R. Ashwin and Pragyan Ojha in the mix. He did bat well on occasions, but that does not really help his cause. The only Indian bowler on tour who looked like a bowler and he bowled his heart out. He bowled a total of 158.3 overs in three Tests and troubled the English batsmen whenever he came on, it was a depressing sight to see this man bowl superbly only to be let down badly by the support cast. However the 158.3 overs took a toll on him and he missed the final Test. PK can be a great third bowler, only if India can find their #1 and #2. Nevertheless he has arrived and arrived big on the Test stage. With Zaheer out of the tour, it was expected that Ishant would take over the mantle as the leader of the pack after his exploits during the West Indies tour. However he was a pale shadow of himself and bowled just one good spell the entire series, that was when India had England on the ropes at 124/8 during the Nottingham Test. Apart from that he was ineffective, appeared jaded and tired. He should improve by leaps and bounds if he nurses any hopes of being a consistent and successful Test bowler. Completed the Indian pop gun attack by being just as ineffective as his peers. Apart from his one spell during the second Test he returned expensive figures during the rest of the games, although there was no shortage of his antics. He claimed a bump ball catch and even managed to bow to the crowd after that when they booed him. It was indeed surprising that the English bowlers with the same style as him were able to exploit the conditions and he was not able to. With not many fast bowling options around, Sreesanth will continue to be in India?s scheme of things, but has to show some performances if he is to be considered a serious candidate. Not being too harsh on him, as a bowler he really does not look Test material. The England batsmen had very little trouble in negotiating his leg spinners and his googlies. Each wicket cost him almost 106 runs and that should tell the story of his bowling. I don’t see the Indian selectors persisting with him for the near future. But he did play a useful part in the lower order with some good knocks, especially the 84 at The Oval. Given the Indian problem at number six Amit Mishra can claim that he is better than Suresh Raina, Yuvraj, Mukund etc. Unless that happens he has to remember that he was picked in the side primarily to take wickets. And his bowling gets a 0/10 – the 4/10 is for his batting. Replacing Praveen for the last Test, he did not make an impressive comeback, gave away 118 runs in 34 overs without picking up a wicket. Used the long handle to good effect in the first innings, it remains to be seen if he is in India’s long term plans especially given India’s injury woes. Can you really argue with a captain that’s just led his team to a whitewash? His captaincy may seem to stick to the orthodox to a frustrating extent, and at times he is slow to adjust the plan. However, Strauss knows his team like the back of his hand, and it’s hard to find a flaw in a captain that keeps racking up the wins. Batting-wise, he wasn’t quite as successful. It doesn’t just feel like a shaky series for the captain, as averaging a tick under 40 seems about par for the course these days. What makes the figures worse is that he had a golden oppertunity for a hundred at Edgbaston, yet gave it away on 87. It’s in stark contrast to the pre-captaincy Strauss, who while not always successful, had made the conversion rate his trademark. Add in the dropped catches and there is a growing sense that the skipper’s team is starting to leave him behind. Strauss will need to get back among the runs this winter, but the Strauss-Flower axis has been crucial to the team’s winning streak and his place is entirely secure. Supported by his team and the backroom staff, he needs to prove to the fans and to himself that he still belongs in a world no.1 outfit. A man whose flawed technique provides an opening for the bowlers early on – but whose concentration and relentless hunger for runs means once that gap closes, it remains stuck fast for hours. From such a man we might expect a few failures followed by a big innings, and that is exactly what he gave us. It was the scale of the big innings that left us wowed – and the opposition utterly demoralised – as Cook drew up the biggest England score since his mentor Graham Gooch’s triple hundred 21 years ago. Cook’s run over the last nine months has ceased to look like a purple patch and more like an opening of the floodgates, and the records are there to be chased. A quiet and injury-tainted series for the Warwickshire man, which has served to dent his monstrous career batting average but not his place as England’s number 3. A chancy 70 in tough conditions, part of a 2nd innings collapse, a rare failure followed by a painkiller-riddled one, all not much to write home about. Is he back? Is he back for good? Two outstanding, domineering hundreds that Viv Richards would have been proud of, along with a couple of breezy fifties came together to record KP’s biggest ever series. All the shots of the old Pietersen – the flamingo, the switch hit, the dismissive front-foot pull – were out in force, but so was the new sense of graft, as he scraped his way through a testing first day to be the star on the second. A criticism levied at this new top-ranked side is that it lacks a member of the very best, and without doubt, if he is truly back for good, Pietersen is the man to fill those shoes. Putting aside the idiotic run out for now, the situation at the start of day 3 of Trent Bridge was not one calling for the old Ian Bell. It was the tipping point of the series, India were bowling well, and England were behind. It called for a hard-nosed no. 3, the likes of Ponting or Dravid, who had both the skill and the steel to put in that matchwinning innings. Three years ago, Ian Bell failed in that situation, time and time again, but now he has changed. 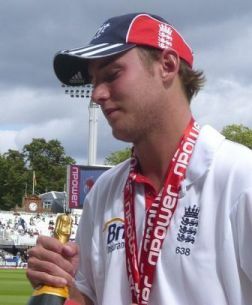 After Broad’s heroics kept the match alive, Bell was the one to win it. Following it two Tests later, when runs were offered up much more easily, he made scoring 235 look effortless, and meanwhile has been an asset in the field. He is becoming the player he should always have been. Morgan on the other hand has many critics still to answer. Having come into the side as England’s best one-day batman, there is no doubting his temperament or his strokeplay. What is questioned, and rightly so, is his technique against the new ball. He scored a ton and a fifty, but they came during phases of play when the opposition hardly seemed to be paying attention, before falling when a new ball or new day re-invigorated them. The criticism comes largely as a result of England’s strength around him. With so many chances given, is he really capable of matching his team-mates’ “daddy” hundreds? Do England really need such a limited batsman ahead of Prior, Bresnan and Broad? The jury is still out on the Irishman’s Test career, but time may soon be called. Yes, he really was playing. Having been given two brief situations to bat in which he really could not have impressed, Bopara just about managed to come out of it reasonably well. He will feel unfairly denied by the success of the top five, as this series has answered almost no questions at all about his Test credentials. If the selectors are kind, they will take him on tour, if only to try and test him again. It’s hard to think of an area where Prior hasn’t soundly beaten his Indian counterpart. While his keeping has kept where it should be, that is, out of discussion – it is as a batsman that Prior makes his case. His form with the willow has not only been prolific, it has come from every match situation. Prior is a man to treat those two impostors, triumph and disaster, just the same – go in and smash the living daylights out of it. Here England have a man who, in his 10-Test career, averages 45 with the bat and 23 with the ball, and he struggles to make the first XI. It boggles the mind. The Yorkshireman bowled tight to keep the Indians under the cosh for the majority of the series, but still found the skill to produce the unplayable (ask Rahul Dravid) and the vicious (ask Yuvraj Singh). With the bat, he found himself kicking a side when they were down – and hard, if his strike rate of 71 is anything to go by. The bittersweet truth for Bresnan is, however, that whilst claiming his place as a world-class allrounder, his is still yet to cement his place in the team. Arguably the most impressive comeback since Lazarus. It would have repaid the faith England have shown in him to have merely kept up with his fellow bowlers, but he has outshone them left, right and centre. Having put in a performance reminiscent of Flintoff at his best at Lord’s, he single-handedly rescued the second Test as he pulled off his Flintoff ’05 mask and pulled on the Botham ’81. England’s dominance in the latter half of the series meant he no longer had to bat, but he still bowled with pace, poise and precision to oust key wickets for not many. Statistically, no all-round cricketer besides Imran Khan has ever had as good a series. If it weren’t for his performance in the final test, Swann would have been the only player India had truly gotten the better of. As it is, an Oval pitch that had lost its top cried out for the world’s top ranked spinner to come on and get through a side, and the offie delivered to seal the whitewash. However, his performance earlier in this series has not been simply a case of unhelpful pitches, and the Indians playing him well. His Trent Bridge efforts were his worst outing for months, and in a similar case of affairs to the Ashes of 2010-11, a bowler cannot consistently average 40 and get away with it. Having been such a key to the shaping of the current England side, there are fears now that his stardom – well deserved though it may be – is beginning to wane. Deserved his four wickets in the one match he got to play, but deserved the 124 runs he conceded too. Some very threatening spells interspersed with leg-side deliveries and no-balls, and more will be expected when he returns to full fitness. Perhaps the most telling part of Anderson’s series was the first innings at Lord’s. He had a genuinely poor day with the ball, and yet still finished with 2/87. This is a bowler that no longer has bad days, figures of 0/120 being a thing entirely of the past. And of course, when he has a new ball and gets it right, even the world’s best has no way to stop him. VVS Laxman, despite his outstanding skill, was made to look utterly foolish twice. Meanwhile, Sachin Tendulkar has never been dismissed by anyone with such regularity. A good try at assessing. I am fine with most of the assessments except for Zaheer… I dont think he should be rated like Bopara.